The Scotsman used his height and reach advantage to outpoint the Australian with scores of 117-112, 117-111 and 117-111 in the 12-round fight. It was the 31-year-old Katsidis's third loss in his past four fights and the result puts an end to his reputation of the ''Brit Basher'' earned from previous wins over Graham Earl and Kevin Mitchell. Katsidis entered the ring wearing his trademark gladiator's helmet while Burns, who was stepping up a division, walked to the ring to Bon Jovi's Living on a Prayer. The Australian was booed when his name was announced. Katsidis stalked his opponent from the early moments of the fight with the eight-centimetre taller Burns intent on using his left jab. The Australian pressed forward but seemed unable to really hurt his opponent while the Scot landed some clean blows on Katsidis. Burns said pre-fight that he intended to follow the tactics of Robert Guerrero, the American who beat Katsidis in April. And he did just that, keeping away from Katsidis and picking him off from a distance. The Australian took plenty of punishment but kept coming forward. However, it was Burns's camp that celebrated with gusto after the bell to signal the end of the fight. Its delight was justified as he came out a comfortable winner in the eyes of the judges. 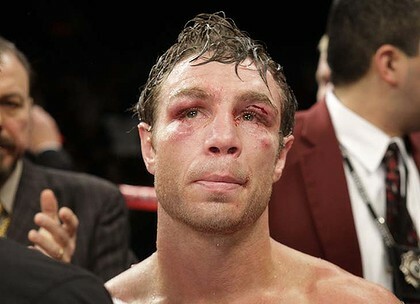 Katsidis's loss leaves his career record at 28 wins (23KOs) and five losses and improves Burns to 32 wins (9KOs) and two losses.